MainAll NewsDefense/SecurityIs the PA trying to launch a new terror campaign? Is the PA trying to launch a new terror campaign? Official PA TV rebroadcasts 41 times Abbas call to prevent Jews 'by any means' from 'defiling our holy places'. Palestinian Media Watch organization monitoring anti-Israel incitement in the PA has recorded a significant increase in PA propaganda encouraging violence against Israeli Jews following President Donald Trump's recognition of Jerusalem as the capital of Israel last month. A speech by PA Chairman Mahmoud Abbas and an inciting music video broadcast repeatedly by the PA in the past when it wanted Arabs to commit terror attacks have been rebroadcast by official PA TV and radio at least 46 times since the US recognized Jerusalem as Israel's capital. Abbas claimed that Jews' presence on the Temple Mount "defiled" an Islamic holy site. He called "to prevent them, "by any means," which is a Palestinian euphemism for violence and terror. Implicitly encouraging Arabs to attack Israelis, PA TV replayed Abbas' call for violence 19 times in three days and eventually broadcast it 32 times during the next month. Five days after the first broadcasts, two Israelis were stabbed to death, and during that month numerous Arabs heeded the call, using knives, guns, and car-ramming to murder 12 Israelis. 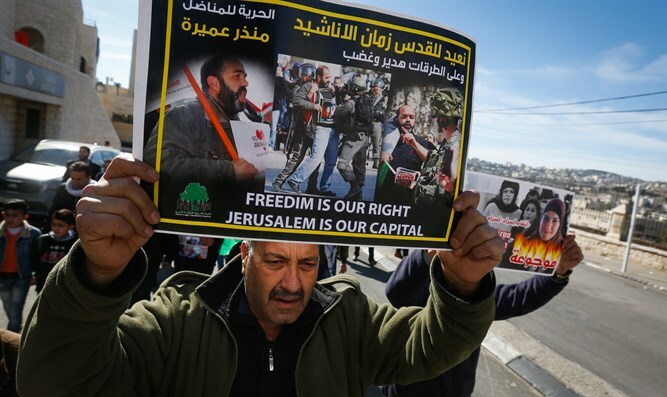 Arabs protest Trump Jerusalem policy - "Freedim is our right"
The day Trump recognized Jerusalem as Israel's capital, PA TV and radio started rebroadcasting Abbas' old call to confront Israelis by "any means." By the beginning of January it had been rebroadcast at least 41 times. 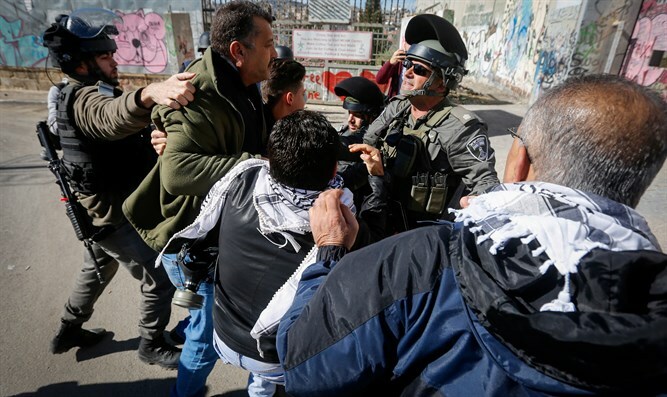 PA Chairman Abbas said: "We have to prevent them, in any way whatsoever, from entering the Sanctuary. This is our Sanctuary, our Al-Aqsa and our Church [of the Holy Sepulcher]. They have no right to enter it. They have no right to defile it. We must prevent them. Let us stand before them with chests bared to protect our holy places." Palestine, our chests will defend you - life or death"
Now PA TV has chosen to rebroadcast this song, adding to it images of clashes between Arab rioters and Israeli police and soldiers. Since mid-December 2017, the song has been broadcast at least 5 times. To remove all viewer's doubt as to the reason for the calls to violence, the clip includes a few seconds of Trump's speech recognizing Jerusalem as Israel's capital. PA TV and radio are owned and controlled by the PA leadership. Their choice to recycle these "successful" calls for terror now is another indicator, together with the other calls encouraging violence Palestinian Media Watch has reported on, that the PA leadership has been trying to ignite terror as a response to US President Trump's recognition of Jerusalem as Israel's capital. The result of the heightened PA incitement has been a dramatic rise of Arab terror attacks. According to the Israeli Security Agency, in Nov. 2017 there were 84 terror attacks, compared to 249 in December 2017.